NEW POWER BLOC IN SOUTH AMERICA? United States power and influence in the Western hemisphere is shrinking — just as Communist inroads are increasing. Key nations in South America are talking of joint economic and political counteraction as never before. A QUICK, three-week, five-nation fact-finding trip to South America confirms this fact: North Americans will soon have to face a new set of political realities in the Western hemisphere. In short, the nations of Latin America are no longer dependent on the historic dominance of the United States in the New World. Along with independence from Washington is coming unheard — of cooperation between previously suspicious and competitive Latin American powers. This cooperation, in turn, is destined to link Latin America as a whole with a burgeoning global economic system centered in Western Europe. The new road to Latin togetherness has been made possible mainly because of one outstanding development: Argentina and Brazil have' decided to swap their historic rivalry for dominance in South America with a new program of cooperation. The mood of harmony was reflected this past May when Brazil's President Joao Baptista de Figueiredo journeyed to Buenos Aires, Argentina. It was the first visit by a Brazilian head-of-government to the Argentine capital in 40 years. President Jorge Rafael Videla of Argentina reciprocated with a visit to Brasilia in August. President Figueiredo's visit was made possible after diplomats of the two neighbors had at last resolved their differences over utilization of Parana River water for huge hydroelectric plants. The history-making meeting, however, was far more than diplomatic icing to top off a political issue already signed, sealed and delivered. An official in the Argentine foreign ministry told me that the two-nation summit conference was "eminently political" and was a "reaffirmation of the new style that rules Argentine-Brazilian relations," opening up "possibilities of wide areas of cooperation" in commerce and industry. As evidence of the new relationship, the two presidents signed, on May 17, a series of far-reaching agreements. First, they inked an accord for nuclear cooperation and, as an initial step, a contract for Brazil to provide the core vessel for Argentina's next nuclear reactor. The intent of the, agreement was not only technological. It was designed to show that Argentina and Brazil, which are both developing nuclear power, do not intend to become rivals in nuclear weaponry. Secondly, the two nations agreed to cooperate in the construction of their national power projects on the Parana and to integrate their resultant energy networks. These and a string of other agreements on expanded trade and mutual investments, according to a joint statement, provide the groundwork for the "integration of the two economies." The new agreements represent what one Argentine official called "a triumph of the obvious." The agricultural sectors of the two countries are largely complementary rather than competitive. And the new pact will open up opportunities for expanded industrial trade between them. Brazilian industry is eager, to sell to Argentina's sophisticated market. And Argentina, despite some misgivings over Brazil's size (123 million people as opposed to 27 million) and aggressive industry, knows that it also needs access to the vast Brazilian consumer society to relieve its industrial stagnation. Brazil's economic Achilles heel is its grave dependency upon foreign energy resources. It imports 84 percent of its oil, most of it from the Middle East, Iraq being the biggest supplier. In an attempt to redress this dangerous imbalance, the South American giant is being forced to come out of its semi-isolation within Latin America. That condition was largely the result of its distinctive historical, cultural and linguistic (Portuguese) roots, which, combined, have kept it at a distance from its Spanish-speaking neighbors. Brazil now intends to increase oil imports from the two major Latin American exporters, Venezuela and Mexico — the latter as a result of an official summertime visit to Brazil by Mexico's President Jose Lopez Portillo. Plans are also far advanced to have supplies of newly discovered Argentine natural gas shipped to Brazil's Sao Paulo industrial complex. Call For Latin "Common Market"
The wide-ranging implications of the new power-shaping alliance do not stop with the two countries themselves. The joint statement issued by Presidents Figueiredo and Videla called for the creation of a "fully effective Latin American common market." Ever since the early 1960s, efforts to form a common market for the Western hemisphere frequently have met with resistance from Latin American countries, including Argentina and Brazil. But now, events are moving swiftly in the direction of economic unity. Taking their cue from the Argentine-Brazil breakthrough, 11 Latin American countries founded, on Aug. 12, a trade organization aimed at turning the region into a common market. The new body is the Latin American Integration Association (ALADI in the Spanish acronym). It is designed to encourage and regulate trade between member countries and promote economic integration and cooperation. The foreign ministers of the 11 countries — all the Spanish-speaking nations of South America, plus Mexico and Brazil-signed the foundation treaty at a ceremony in Montevideo, Uruguay. Member governments still have to ratify the treaty. ALADI replaces the unsuccessful Latin American Free Trade Association (LAFTA), founded in 1961 with similar aims. ALADI has three categories of members: less developed — Bolivia, Ecuador and Paraguay; more developed — Argentina, Mexico and Brazil; and countries at an intermediate stage — Colombia, Chile, Peru, Uruguay and Venezuela. The new framework cuts across ideological lines also, grouping together democracies with the several varieties of military governments now in power in the Latin American world. Such talk of South American integration is not new. But this time, there is a certain ring of determination about it. Says William Giandoni, the Copley News Service Latin American writer: "There is new talk of a 'United States of South America'.... Clearly Figueiredo is thinking' in terms of eventual continental integration and, what is more, General Videla and many of the farsighted men around him appear to have a similar object in mind." The new common front being displayed between Brazil and Argentina is not the only example of hemispheric solidarity on key issues. The two Latin American "petropowers," Venezuela and Mexico, are developing a new joint program to provide, on a 50-50 basis, secure oil supplies to the countries of Central America and the Caribbean regimes. Because of the high Organization of Petroleum Exporting Countries (OPEC) prices (Venezuela is an OPEC member; Mexico is not, but pegs its price in the same latitude), the two, petropowers will finance 30 percent of their joint supplies by means of long-term, low-interest loans. Both Venezuela and Mexico are deeply concerned about the political chaos now rife in the countries of Central America. They hope their program will increase stability in the region. A Venezuelan source also told me of another significant fact of the Venezuela-Mexico joint project: It is the first example of south — south cooperation in Latin America — as opposed to north-south, where one party has been English-speaking North America. There is a great deal of national pride wrapped up in this project. The new political assertiveness of the Latin American countries reflects near — universal concern in the region over the declining power and influence of the United States. The norteamericanos may never have been exactly loved, but Washington has nevertheless been the military guarantor of the entire Western hemisphere. Now everywhere, the United States is perceived as a power on the skids. "What links Brazil and Argentina, particularly at this time," notes one expert, "is a growing fear that they can no longer rely on the United States to defend the Western world." Many knowledgeable Latin Americans wonder if the United States even perceives any longer what is at stake in the Western hemisphere. An American professor was recently quoted in Latin American Times as saying that Latin America "is neither strategically, politically, economically nor ideologically of life-or-death importance to the United States." A reader from Venezuela (supplier of 8 percent of U.S. oil imports) justifiably called such assertions "incredible" and "very poor judgment." In Latin America, U.S. policy• of late has flip-flopped and floundered. In making human rights the centerpiece of U.S. foreign policy, the Carter administration has alienated nations such as Argentina and Chile who struggled to the near — death with Marxism and communist — backed guerrilla terrorists in the 1970s. The Argentines feel that if the Marxists ever gain control of all of Central America they will be in a position to threaten Mexico and its vast oil fields, to the north, and the Panama Canal and Venezuela and its oil and other South American countries, to the south. The newly emerging powers of South America, however, will not be comfortable existing in some sort of hemispheric vacuum. They are, as I was told repeatedly in Argentina especially, part of Western culture and tradition. However, many of them trade, for profit, with the communist world. And Argentina, for one, would not go along with Mr. Carter's call for a post-Afghanistan grain embargo. Also Brazil defied the U.S. plea for a Free World boycott of the Olympic Games in Moscow by sending a team. Yet all of these countries want to maintain a comfortable political distance from Moscow. Where then, is Latin America to turn for assistance, even a good measure of guidance? A Times of London dispatch provides a clue: "In general, a gradually unifying Latin America would become a much more interested economic and political partner for Europe, although Europeans are slow to understand it." Not that Western Europe, or some of its key nations, are not already vitally interested in the region. Far from it. Nearly half of West German private investment in developing countries, for example, is now plowed into Latin America, with the emphasis on Brazil. 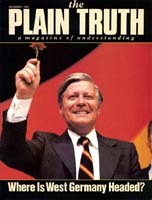 Chancellor Helmut Schmidt toured Latin America in May of 1979, followed a few months later by Bonn's economic affairs minister. West Germany, moreover, has been far more circumspect than Washington in condemning military governments out of hand, choosing the path of quiet diplomacy rather than noisome ideological pronouncements. When Spain becomes a member of the European Community (Common Market) in the near future, look for that nation to playa special role, because of its historical, cultural and current economic links with Latin America. The Common Market as a unit, with its centralized machinery in Brussels, will inevitably play an even greater role in Latin American affairs than it now does. The Common Market is already the dominant trading bloc in the world, carrying on three times as much external trade as the United States. And now the nine-nation bloc is emerging as an independent political force, developing its own policies for key world regions, such as the Middle East, independent of Washington if need be. Europe is beginning to speak with one voice on the interests that concern it. The Economist of London warned recently that to be independent " means having the capacity to act separately and differently than America, not just in side issues, and matters of tactic, but in the heart of the matter, which is the business of keeping Western Europe out of the Soviet sphere of control." This fundamental issue — keeping out of the Soviet orbit — deeply concerns South American powers too. Latin Americans, as do Europeans, see a vacuum of U.S. leadership in the Free World that is likely to last well beyond the recent U.S. national elections. This vacuum will be filled — by a resurgent European third force, a coming economic, military and religious/cultural powerhouse. The 18th chapter of the book of Revelation depicts an end-of-the-age worldwide European economic system, exercising the same force over the modern world that ancient Babylon did 2,500 years ago over the ancient world. It will be an economic order encompassing much of the political world. It will reach its zenith after the decline and fall of the English-speaking powers. The key raw materials and industrialized products of Latin America will of necessity be drawn into such an alignment. Verses 11 through 13 of Revelation 18 even mention some of the exportable wealth of the Latin American world — silver, wood, iron, wheat, cattle and sheep. Watch Latin America — and Europe!